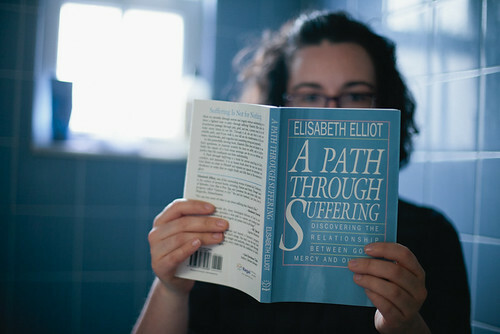 Elisabeth Elliot is a badass Christian woman who’s been through a lot of trauma (wikipedia) and has written about it with honesty, vulnerability, and courageous faith. She expects the same from her readers, and since this double vision doesn’t seem to be going away, I want to learn how to live a full and joyful life despite this constant burden. A six-year-old boy wrote to me, “My grandmother has a brain tumor. The doctor says she only has six months to live. Can you help me about this?” He enclosed a picture of himself. I held it in my hand and studied the little face – so sweet, so wistful. Could I help him about this? I appreciated the author’s broad definition of suffering – from a teenager not being allowed to do what they want (which, to a teenager, is TOTALLY THE WORST) to those living with chronic pain. It was a hard book to read – I tried to pace myself, to pay attention to the lessons.